Bearing in mind the Dow fell just under 90% from its 1929 peak, the comparison with these empirical facts suggests we might experience no less than a virtual collapse in financial asset values. However, there is an important difference between then and now: during the Wall Street crash, the dollar was on a gold standard. In other words, the price-effect of the depression was reflected in the rising purchasing power of gold. This time, no fiat currency is gold-backed, so a major credit, economic and systemic crisis will be reflected in a falling purchasing power of fiat currencies. Therefore, the change in purchasing power of a fiat currency is only part of the story. However, the comparison between purchasing powers for gold and fiat currency is the most practical expression of the change in purchasing power of a fiat currency, because the choice for economic actors for whom gold has a monetary role is to prefer one over the other. It is an ongoing process, about to accelerate. 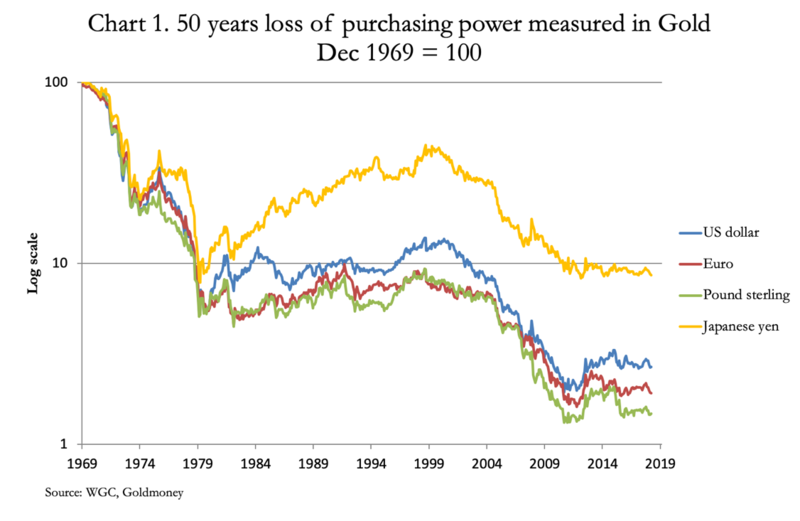 Chart 1 shows how four major currencies have declined measured in gold over the last fifty years. The yen has lost 92.4%, the dollar 97.42%, sterling 98.5%, and the euro 98.2% (prior to 2001 the euro price is calculated on the basis of its constituents). Following its peak in September 2011, gold found a bottom at $1047 in December 2015. 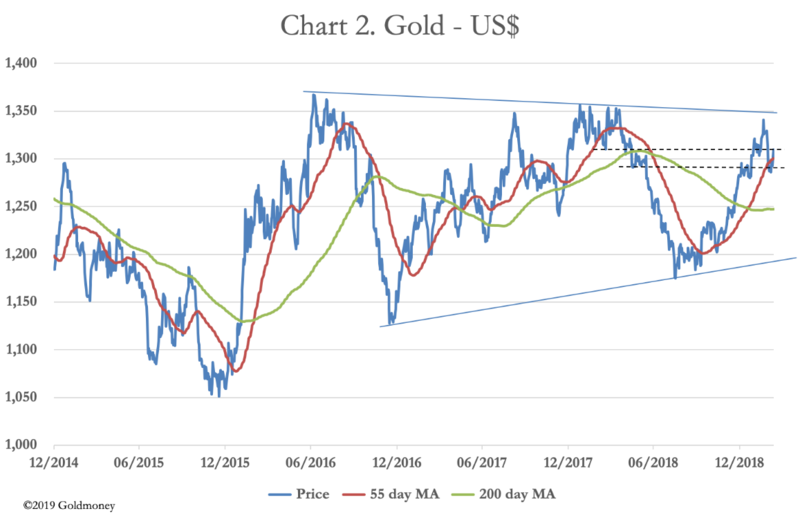 That was followed by a 31% rally to $1375 in July 2016, since when gold has established a triangular consolidation pattern. Last August, the price sold off to $1160, becoming oversold to record levels. That established the second point of a rising trend, marked by the lower solid line. The realisation that the dollar faced the prospect of uncontrolled price inflation forced the Fed to raise interest rates so that the banks’ prime rate exceeded 21% in December 1980. This was sufficient to prevent the gold price from further rises, and physical gold then became the collateral of choice for a developing carry trade. Central bank sales were designed to signal the demonetisation of gold and deter buyers. 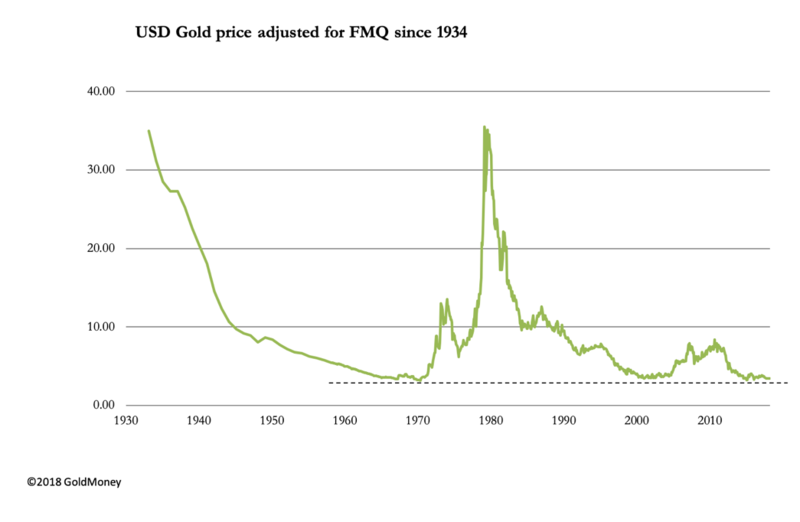 They leased significant quantities of bullion for the carry trade, which increased supply synthetically and drove the gold price back to the same extreme valuation lows seen in the 1960s. This was 2000-2002. The gold market has three basic elements to it. There is an underlying stock of approximately 170,000 tonnes, increasing at about 3,000 tonnes a year. It is impossible to define how much of the total above-ground stock is monetary gold, not least because jewellery in Asia is bought as a store of monetary wealth and is used as collateral against loans. However, if we are to classify Asian jewellery as non-monetary gold, then monetary gold in the form of bars and coin is thought by many experts to represent between thirty and forty per cent of the total. Assuming a median estimate of 35%, this is 60,000 tonnes, of which 33,760 tonnes is stated to be in national reserves. This leaves an estimated 26,240 tonnes of investment gold in public hands, worth $1.1 trillion. Much of this can be regarded as being in long-term storage. For market purposes, the physical market on its own is relatively illiquid. Secondly, there are regulated futures and options markets, the most important of which is America’s Comex. Currently, there are about 520,000 Comex contracts of 100 oz each outstanding, which are worth a total of $68bn. Options on futures total a further 220,000 contracts, which are impossible to notionally value, being puts and calls at varying strike prices. The problem investors will then face is mathematical. There are probably less than 30,000 tonnes of monetary gold, excluding Asian jewellery, in private hands, today worth about $1.1 trillion. According to The Boston Consulting Group, in 2015 there were $71.4 trillion of portfolio assets, of which $36.1 trillion were in US dollars. With the monetary gold held outside government reserves being about 1.5% of portfolio assets, how do you replace non-performing fiat-currency dependent assets with a portfolio designed with sound money in mind? The removal of cash as an effective escape route for investors fleeing systemic risk turns systemic risk directly into a collapsing preference for money relative to goods, gold, cryptocurrencies and the rest. One it starts, it could happen quite quickly. © 2017 GOLDMONEY INC. ALL RIGHTS RESERVED. THIS MESSAGE MAY CONTAIN CONFIDENTIAL OR PRIVILEGED INFORMATION. IF YOU ARE NOT THE INTENDED RECIPIENT, PLEASE ADVISE US IMMEDIATELY. THIS MESSAGE IS FOR GENERAL INFORMATION ONLY AND SHOULD NOT BE CONSTRUED AS AN OFFER OR SOLICITATION OF AN OFFER TO BUY SECURITIES OR ANY OTHER FINANCIAL INSTRUMENTS. WE DO NOT PROVIDE TAX, ACCOUNTING, OR LEGAL ADVICE, AND RECOMMEND THAT YOU SEEK INDEPENDENT PROFESSIONAL ADVICE IF NECESSARY. WE CONSIDER INFORMATION IN THIS MESSAGE RELIABLE BUT WE DO NOT REPRESENT THAT IT IS ACCURATE, COMPLETE, AND/OR UP TO DATE AND IT SHOULD NOT BE RELIED ON AS SUCH. OPINIONS EXPRESSED ARE OUR CURRENT OPINIONS AS OF THE DATE APPEARING ON THIS MESSAGE ONLY AND ONLY REPRESENT THE VIEWS OF THE AUTHOR AND NOT THOSE OF GOLDMONEY INC OR ITS SUBSIDIARIES UNLESS OTHERWISE EXPRESSLY NOTED. Notice: This email may contain confidential or privileged information. If you received this email in error or believe you are not the intended recipient, please notify the sender immediately and delete this email without forwarding or opening any attachments. Thank you for your cooperation and attention.